Destruction is an extremely flexible, “jack-of-all-trades” specialization with a broad enough toolkit to find purchase on any encounter. Destruction’s main strength is the ability to provide frequent ‘fingertip’ burst via Chaos Bolt, along with strong, consistent cleave. This spec easily allocates add damage without having to bank resources too heavily, and it’s not limited by cooldowns to excel in this role. It can also provide the most potent sustained AoE damage of any class or spec in the entire game. Unfortunately, this spec is heavily reliant on gear and is punished severely by movement. 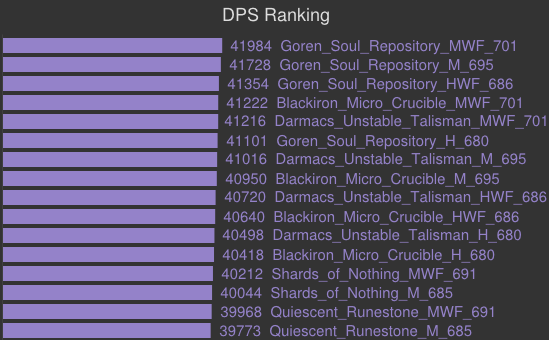 Though it may not be as dominant as Demonology in Blackrock Foundry, it currently ranks as one of the stronger overall specs this tier. This is the basic rotation and priority system. In the Advanced Play section I’ll cover more complex methods to greatly improve your play. You should be using Grimoire of Sacrifice when playing Charred Remains. 1) Keep Immolate applied to the main target at all times. Immolate does moderate damage and criticals generate one emberbit, and you can apply it manually to up to three targets for a single target increase. Immolate only needs to tick a single time for it to be a DPS increase — approximately 2.5s in average haste levels. 2) Cast Conflagrate as often as possible to generate Burning Embers. Conflagrate has two charges, and grants the Backdraft buff. Chaos Bolts consume 3 Backdraft stacks at a time while Incinerates consume only a single stack. Always spend this buff on Incinerate where possible for a large increase in both ember generation and mana sustainability. You should never let Conflagrate sit on 2 charges. Spending Backdraft on Chaos Bolt is more common and less egregious of an error when playing Charred Remains, though you should still aim to avoid it where possible in practice. 3) Cast Incinerate to generate Burning Embers. 4) Cast Dark Soul: Instability on cooldown. You should always save at least 3.5 Burning Embers for this dump. While Dark Soul is active, cast Chaos Bolt, or Shadowburn where applicable, as many times as possible. Ensure a freshly applied Immolate is refreshed before entering this dump so you don’t have to re-apply halfway through. 5) Cast Chaos Bolt and Shadowburn when you have major procs active, such as trinkets. You should always cast an ember consumer regardless of your active procs if you are in danger of capping Burning Embers. Try to avoid casting Chaos Bolt if you have more than two Backdraft stacks, though, there are situations that exist where this cannot be avoided. Consider that Chaos Bolt has an extremely slow flight time, so if you’re casting it on adds that melt quickly you will lose both the damage and the ember if your target dies mid-flight. Spells affected by Havoc are: Immolate, Incinerate, Conflagrate, Chaos Bolt, Shadowburn, Mortal Coil, and Spell Lock. Chaos Bolt consumes all 3 stacks of Havoc. All other spells consume a single stack. Havoc is best spent on Chaos Bolt if both targets are above 20% health. Shadowburn is the best use of Havoc stacks if you can cast at least one Shadowburn + at least one other spell before the target dies, with the obvious ideal situation being 3 Shadowburns cleaved via Havoc. Havoc can be used for single target purposes. On fights with irrelevant adds, you can put Havoc up then copy Incinerate/Conflagrate/Immolate. This will effectively double your ember generation for 3 casts, greatly increasing the rate at which you can cast ember consumers. A good example of this was the desecrated axes on Garrosh, or the second head on Megaera. Havoc is typically unaffected by range or line of sight requirements. For instance, you can apply a Havoc to an add on the Blackhand balcony, jump down and chaos bolt the boss, and it will copy to the balcony add. In any situation where you can Havoc on cooldown it is usually best to do so. It’s more important to copy as many spells as possible, rather than observing the normal rules with consumers and waiting for procs. 7) Use Fire and Brimstone in situations where you need to deal AoE damage. The same priority system applies to Fire and Brimstone spells as single target. It takes approximately 5 targets to sustain Fire and Brimstone, decreasing as you gain critical strike rating. 8) Use Rain of Fire on 8+ targets. Rain of Fire deals 50% increased damage to targets afflicted with Immolate, so ensure that it is applied before you lay down Rain of Fire. If two Rain of Fires overlap, the target(s) in both will only take damage from the most recently applied Rain of Fire. This is the basic rotation and priority system. In the Advanced Play section I’ll cover more complex methods to greatly improve your play. You should be using Grimoire of Sacrifice when playing as Cataclysm. Cataclysm is best played on encounters that enable you to use it on multiple targets (3-4) on cooldown, the best example of which are “Council Style” fights. 1) Cast Cataclysm to apply Immolate. 2) Keep Immolate applied to the main target at all times. Immolate does moderate damage and criticals generate one emberbit, and you can apply it manually to up to three targets for a single target increase. Immolate only needs to tick a single time for it to be a DPS increase — approximately 2.5s in average haste levels. 3) Cast Conflagrate as often as possible to generate Burning Embers. Conflagrate has two charges, and grants the Backdraft buff. Chaos Bolts consume 3 Backdraft stacks at a time while Incinerates consume only a single stack. Always spend this buff on Incinerate where possible for a large increase in both ember generation and mana sustainability. You should never let Conflagrate sit on 2 charges. 4) Cast Incinerate to generate Burning Embers. 5) Cast Dark Soul: Instability on cooldown. You should always save at least 3.5 Burning Embers for this dump. While Dark Soul is active, cast Chaos Bolt, or Shadowburn where applicable, as many times as possible. Ensure a freshly applied Immolate is refreshed before entering this dump so you don’t have to re-apply halfway through. 6) Cast Chaos Bolt and Shadowburn when you have major procs active, such as trinkets. You should always cast an ember consumer regardless of your active procs if you are in danger of capping Burning Embers. Try to avoid casting Chaos Bolt if you have more than two Backdraft stacks, though, there are situations that exist where this cannot be avoided. Consider that Chaos Bolt has an extremely slow flight time, so if you’re casting it on adds that melt quickly you will lose both the damage and the ember if your target dies mid-flight. 8) Use Fire and Brimstone in situations where you need to deal AoE damage. The same priority system applies to Fire and Brimstone spells as single target. It takes approximately 8-10 targets to sustain Fire and Brimstone, decreasing as you gain critical strike rating. 9) Use Rain of Fire on 8+ targets. Rain of Fire deals 50% increased damage to targets afflicted with Immolate, so ensure that it is applied before you lay down Rain of Fire. If two Rain of Fires overlap, the target(s) in both will only take damage from the most recently applied Rain of Fire. 2) Cast Conflagrate as often as possible to generate Burning Embers. Conflagrate has two charges, and grants the Backdraft buff. Chaos Bolts consume 3 Backdraft stacks at a time while Incinerates consume only a single stack. Always spend this buff on Incinerate where possible for a large increase in both ember generation and mana sustainability. You should never let Conflagrate sit on 2 charges. 4) Cast Grimoire: Doomguard and Dark Soul: Instability on cooldown. You should always save Grimoire: Doomguard and at least 3.5 Burning Embers for this dump. While Dark Soul is active, cast Chaos Bolt, or Shadowburn where applicable, as many times as possible. Ensure a freshly applied Immolate is refreshed before entering this dump so you don’t have to re-apply halfway through. 7) Use Fire and Brimstone in situations where you need to deal AoE damage. The same priority system applies to Fire and Brimstone spells as single target. It takes approximately 8-10 targets to sustain Fire and Brimstone, decreasing as you gain critical strike rating. The best single target option when paired with Demonic Servitude if you don’t have the gear to support Sacrifice/Charred Remains. Scales poorly with increased number of sustained targets. The best option when paired with Charred Remains, T17 4-piece, and Goren Soul Repository. Scales much better than the other two options. Rain of Fire is too weak currently for this talent to be considered. Best paired with Grimoire of Sacrifice. Greatly simplifies the rotation and provides the strongest overall damage, with a few exceptions. Requires a reasonable amount of gear to support. Punished heavily by movement. Best paired with Grimoire of Sacrifice. This is the best option for Challenge Modes and “Council Style” fights (3-4 bosses) where you can reliably hit at least 3. Best paired with Grimoire of Service. Allows you to replace your Summon Doomguard and Summon Infernal spells with permanent pets. Your Doomguard hits extremely hard, and once every two minutes you will be able to summon a second Doomguard via Grimoire: Doomguard (when playing Service). All Doomguards hit 20% harder when the target is below 20% health. This is the best option for single target if you don’t have the gear to support Charred Remains. Halves the duration and cooldown of Dark Soul. Generally speaking this glyph is rarely used unless you’re speccing Charred Remains. If you’re playing Charred Remains this glyph is usable on low movement fights, as it increases the number of buffed Chaos Bolts you can get off per minute. Regardless of what spec you play this glyph gets weak the shorter the fight gets as it hurts your uptime, so you’ll want to avoid it on fights like Butcher and Tectus. While I recommend testing both glyphed and unglyphed to find your preference, there are typically more advantages to playing unglyphed. Has no effect for Destruction. Does not make your Imp magically do more DPS! One thing that is extremely important to understand, no matter what class you play, is the relative values of stats to your character. In most cases, stats you have very little of will inflate in value, while stats you have a surplus of will diminish in value. What this means for you is that the stat priority isn’t ironclad; Multistrike and Haste, for example, have interchangeable value depending on how much or little of each you have. increases the damage done by all of our damaging spells, albeit at varying degrees of effectiveness. The damage of ember consuming spells is affected most, though our pets remain unaffected. This makes Mastery particularly strong when Grimoire of Sacrifice is chosen. Increases your chance to critically hit with your spells. Conflagrate and Incinerate generate double emberbits when they critically strike, and Immolate generates one emberbit. Chaos Bolt damage scales linearly with critical strike chance; 1% crit is exactly 1% bonus damage on your Chaos Bolt. 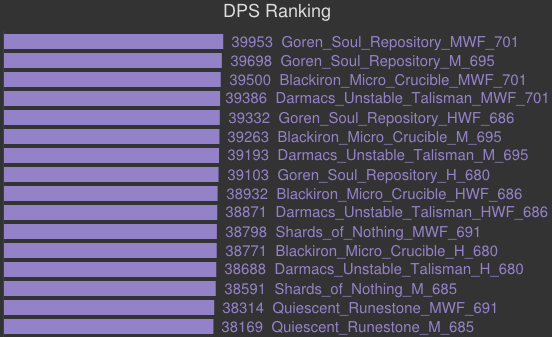 Haste is a mediocre stat for Destruction, since our GCD is baseline 1s via Chaotic Energies. While haste does affect the speed at which you regenerate mana, you also cast faster at an equal and linearly scaling rate, effectively making a haste a mana neutral stat. While haste is not a very effective stat on single target, it does gain value on sustained AoE. It also scales well with our 2-piece set bonus. Put a Demonic Circle down outside your assigned lane as an insurance policy against rolls. You can forego Eternal Resolve glyph if you’re afraid you might get rolled over. Place a gateway to help you and your raid with movement between the lanes. Take advantage of Havoc and Immolate on the crates during the intermission phase. If you get a second crate phase while the boss is in execute you should cleave Shadowburns onto the crates via Havoc. Place a Demonic Circle near your starting point to help you reset positioning for the second set of smart stampers, and help you traverse the room during Searing Plates. Use Havoc on cooldown to cleave Chaos Bolts and Shadowburns. Re-apply Immolate before either boss jumps up, as it will continue to tick and generate embers while the boss is on the balcony. If you’re struggling with the heavy movement, Kil’jaeden’s Cunning is a viable alternative on this encounter. Place a Demonic Circle to help with movement and avoiding the flame breath. Make sure you are using Havoc on cooldown. Use the spears and Pack Beasts as Shadowburn fodder for bonus embers. You should apply Immolate to the spears when you aren’t casting Chaos Bolts for a bit of bonus damage and embers. Place a Demonic Circle so you can instantly teleport back to the ground after Petrifying Slam. Place a circle wherever your spot in the room is, in case you get Molten Torrent and have to run to melee. You should be able to sustain Fire and Brimstone if all 4 dogs are stacked in melee range. Make sure you reapply Immolate right before the dogs die as DoTs continue to tick on them after they despawn. Place a Demonic Circle in the lane adjacent to the boss on the far right. You can use this to dodge the first deforester and a second deforester later in the fight. Gateways can be used to help your raid deal with deforesters as well. Use Havoc to help kill Gunnery Sergeants quickly and burn down priority targets, such as Man-at-Arms. Use Havoc on cooldown. Glyph of Dark Soul is usable on this fight as there are frequent priority targets, though my preference is still unglyphed. You can place gates to help with the sides uniting after Phase 1, or to help your side reach the first bellows immediately. Place a Demonic Circle on top of your assigned hand area for quick movement. Place a Demonic Gateway to help with movement between pillars. You should be able to destroy the hand phase with Fire and Brimstone. Ensure you do apply a Fire and Brimstone Immolate as the sheer amount of targets will result in a plethora of 2-piece procs. If your guild is really struggling with the sub 20% phase, or you need to be more effective on boats, I would recommend playing Charred Remains instead. Keep full DoTs on all three and cast Cataclysm on cooldown. Save your second Dark Soul charge for the execute phase where you can cleave Shadowburns constantly via Havoc. If you go up on Ga’ran’s boat you can use your Havoc to generate bonus embers on the shielded mob by cleaving Incinerates/Conflagrates. Place Demonic Circle and Demonic Gateway in Phase One to assist with movement. Save second Dark Soul charge for execute as Phase 3 is extremely important. You can use Havoc cleave and Immolate to provide heavy Siegemaker damage without switching off the boss. Use your Demonic Circle in Phase 3 to immediately port back after Impaling Throw hits you. Some people like to use mouseover macros for Havoc and Shadowburn, though if you decide to do this I recommend you have a separate bind for the macro. If your mouseover target is friendly or dead, it will instead apply the spell to your current target.